Finding Awesome Amidst a Crazy Travel Day - JP loves LIFE! So often as I travel at the holidays, I find myself wondering about my fellow man. With my day starting off with a rainy, icy mess, I have to admit my hopes weren’t too high. But I tried to be a bright spot with only friendly glances and words. I worried this would be a crazy travel day, the kind I try to help people plan their way through but hoped it could be better. You know how those crazy travel days go? People who are late, in bad moods, or who seem oblivious that the world doesn’t revolve around them crash into you? The days where I use noise-cancelling headphones to avoid getting dragged down by folks who are spreading their bad moods like the most contagious disease known to man! But today I ended up sitting next to some awesome folks and never even reached for the headphones! The flight attendants had us laughing the minute we got on the flight. And Robert made sure we watched his safety demo cause he was having so much fun doing it! There was good cheer all around even though a kid in the row behind us spent most of the flight kicking the seat, slamming the tray, etc and despite someone in our row spilling their drink in their lap. We talked about who we were headed to see, where all we have lived and what we do for work, how native peoples live in the US, the various cultures who collide everyday and creating greater understanding, how one of us had missed time with his son growing up and was committed to doing better with his grands and a lady restarting a cattle ranch with red Angus after having moved away from the farm years ago. 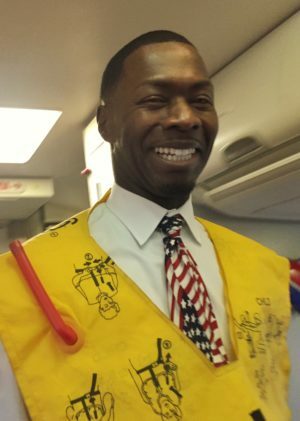 The Southwest flight crew was on top of everything! I half expect to hear from the flight attendant for the front of the cabin again…. Joseph and I had such a great time chatting that I gave him my card! Hope the rest of my travel day goes so smoothly, hope yours does too! And hopefully if my day takes a less than awesome turn, I can keep from taking others down with me!